Jean Burgess Sellers, RN, MSN, OCN, graduated from the UNCG School of Nursing with a BSN in 1998 and received her MSN in 2001. She worked served the High Point Regional Health System as Oncology Patient Care Coordinator for several years before moving to Morehead City, NC where she is Clinical Director for Home Health and Hospice at Carteret General Hospital. 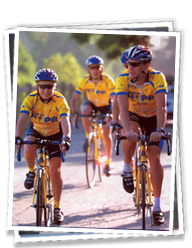 Jean made news headlines in the Fall of 2003 when she became part of cyclist Lance Armstrong’s first Bristol-Myers Squibb Tour of Hope which helps increase awareness of clinical trials for cancer patients. Jean was one of 26 cycling colleagues who rode from Los Angeles to Washington, DC. in October 2003. Jean came to nursing later in her adult working career rather than early. Like many nurses, she entered nursing after a life-altering family crisis. A stay at home mom most of her adult life, Jean observed first the nature of terminal illness when her father, George Burgess, Jr., developed a malignant brain tumor over 14 years ago. She watched him die of the disease nine months later and decided she had to do more to help people suffering from such illnesses. She completed an associate degree in nursing program at Randolph Community College in 1994 and then entered the UNCG School of Nursing RN to BSN program. In 2001, she completed an MSN and was awarded the Sigma Theta Tau MSN Award for Excellence and the MSN Leadership Award. In 2002, she was awarded the North Carolina Nurses Associate Oncology Nurse of the Year, and in January 2004, Governor Mike Easley appointed her to the North Carolina Advisory on Cancer Coordination. Jean is an outstanding and loyal ambassador for the UNCG School of Nursing. She is a transformational leader in the development of programs for cancer awareness, cancer care and palliative care. She encourages everyone with her enthusiasm and willingness. But first and foremost, she serves the needs of her patients and in doing so, empowers patients and their families with information and education so they can understand their disease and treatment options. “My goal is to take away the fear of the unknown and enable them to be active participants in the decision-making process,” says Jean.